Droom brings its uniquely innovative and disruptive platform for buying and selling automobiles online to the Apple App Store this week. 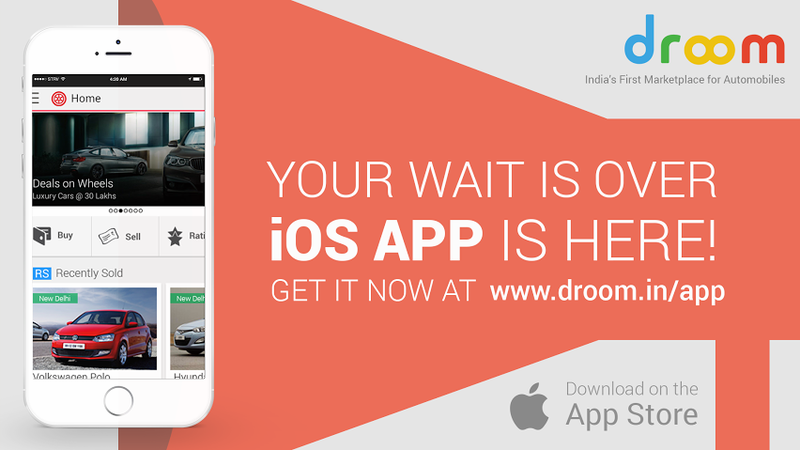 Droom, India’s first marketplace for buying and selling automobiles online, is now available on the Apple App Store and the Android Play Store. Following the release of its Android app launch and its fully transactional website – www.droom.in in early 2015, the platform will now be available to iPhone, iPod Touch, and iPad devices running iOS8 or below for free. Droom understands that you lead busy lives but still want the bang for your buck. Traditionally, buying and selling used automobiles is a process which is time- and energy-consuming. Droom can help you make this prime decision better, smarter, faster, and more conveniently. Droom is a technology-driven marketplace, enabling transactions between buyers and sellers of vehicles by enabling trust, transparency, and mitigating informational asymmetry. With the app, users will be able to browse listings of all types of vehicles. Users can also list their own vehicles for sale. With the concept of commitment fee, full-circle trust, as well as offerings of integrated services around vehicles such as auto inspect and car-care – Droom is a holistic platform for all things automobile. Droom sees over 8k daily visitors to its website. Its Android app has seen over 2 lakh downloads. The company is backed by leading global venture investors. Founded in April 2014 in Silicon Valley, Droom is India’s first marketplace to buy and sell new and used automobiles. Droom is a completely innovative and disruptive approach to how automobiles should be bought and sold online. The current experience of buying and selling an automobile is antiquated, completely broken and full of stress, anxiety, pain points and pitfalls. Droom offers a truly 21st century experience in buying and selling automobiles.